← A Tattoo on a Memory Stone, Such a Great Idea for a Funeral Favor! A recent BBC news article explores a growing interest in funeral photography, and the featured woman’s story inspired me to write this post. The woman, Nibs Southall, explains in the article that she often looks back at the photos of her husband Nick’s funeral—and that there’s one to which she always returns. 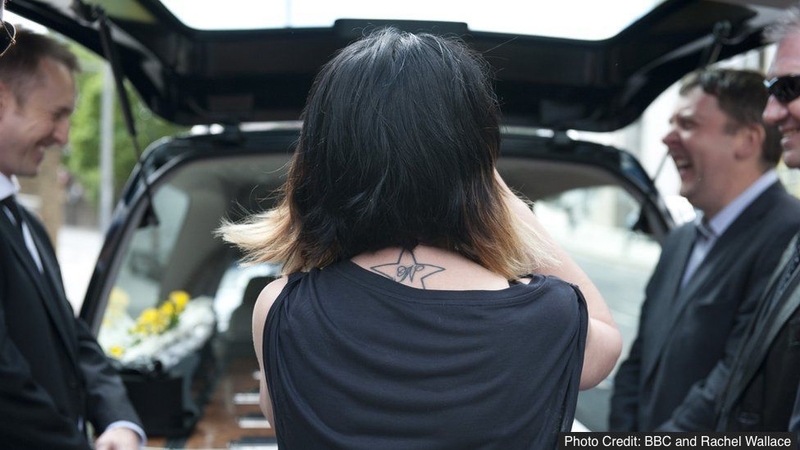 In the picture (see above), she sees herself facing the hearse, back to the camera. The tattoo on her back, which Nick had too, reads “N”. Suited men flank her on either side. The solemn scene is broken by their wide grins. The notion of funeral photography remains unfamiliar to many people and can prompt a response of surprise. Yet, as our approaches to celebrating a life and saying goodbye continue to evolve, the value of this photography is gaining recognition and increasingly appreciated. For close family and friends, a memorial or other gathering can go by in a blur. Others, meanwhile, may not be able to attend. Having photographs from the day allows reflection on the occasion later: family and friends who came from near and far, moments of compassion, kindness and support, laughter at stories shared, and special details such as flower arrangements, photos displayed, or personal items from a memory table. Funeral photographs can also become part of a family record of milestones, preserving for generations to come a memory of the celebration and tribute paid to a loved one’s life. When photographing a funeral, sensitivity and discretion are key. I work carefully to avoid disturbing the proceedings and do not use a flash. Losing a loved one is a fundamental aspect of life that we all go through. As a funeral photographer, it is an honor to create enduring images of such a significant occasion for the bereaved. This entry was posted in funeral ideas and tagged Bay Area Funeral Photographer, celebration of life ideas, funeral ceremony, funeral ideas, Funeral photographer, funeral planning, life celebration ideas, memorial service ideas, memorial service photos, share funeral experiences. Bookmark the permalink.